When Harrold Centre was opened in 1901 it was known as Harrold Institute. It was built to enable the men of the village to learn new ideas and skills. Local philanthropist, Charles Pettit, provided the funds for the place to be built (as he had helped in building the Congregational Chapel earlier). The Institute Hall was added ten years later. The Congregational Union of England held the premises in trust for the people of Harrold until the early 1970s. In its heyday, the Institute held many events, including regular dances with the band in a gallery above the hall. The grounds at the side contained a bowling green and, at the rear, grass tennis courts. Inside there was a billiard table and library. It was the scene of village wedding receptions, school concerts and whist drives. By the late 1960s, however, the Institute was little used, apart from the WI, who had used it continuously since 1926, the Snooker Club and a Saturday morning dancing class. It was in need of refurbishment and the Congregational Union Trustees decided to bequeath the buildings to the village. A new trust was set up to manage affairs and to improve the facilities, and this was drawn from representatives from village organisations and from Carlton and Odell. The two buildings were joined together and a new bar and kitchen were added. What is now the Red Room, used for smaller meetings, was originally a bank and a table tennis room. The ground to the rear was leased to Harrold Tennis Club who built hard tennis courts. Strangely there was, at the time, little interest in renovating the old bowling green (Harrold now has its own Bridgman Bowls Club with indoor and outdoor facilities and a very large membership!). The grounds also include a children’s play area. In 1974 the new management committee opened the refurbished building (now known as The Centre) with a St.Valentine’s Day dance. 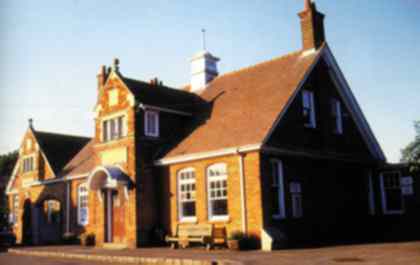 Many organisations now use the premises including, on a regular basis, the Corner Club and Harrold Pre-School. It is the base for drama productions (Ad Hoc) and numerous special events.